Create a Site Map | Give Visitors and Search Engines What They Need- A Website Map! Why should you create a site map? What is a website map anyways? How do you go about creating a site map? Web site maps are an important element of any site. Site maps a quick and easy way for your visitors to find the information they are looking for, quickly! Website maps are also a critically important navigation tool that helps search engines catalog all the content and web pages on your site. Frankly, the presence of a site map is your best insurance that your web pages will be indexed by the major search engines like Google, Yahoo, MSN and Ask. 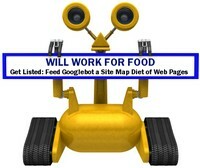 Think of your site map as yummy spider food for the search engines. They are great way to improve search engine optimization because website maps ensures that all your web pages are available and can readily be found by the search engines and visitors alike. A website map is simply a listing of all the pages on your website. That's all! Nothing fancy. Not too difficult. A site map is a collection of links grouped by topic area. It serves as the architectural structure for your website. (And is actually a representation -in outline form- of your small business website plan). 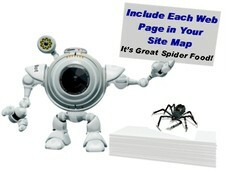 A website map helps your visitors and the search engines find all your web pages. Web site maps serve as a clear, descriptive outline of your site. It helps both your visitors and the search engines locate all the information and pages on your site in a glance. There is no need to make it complicated either. Just keep it super simple. Creating a site map starts with a heading for all your tier two pages. Then simply list the links of the tier two and related tier three pages under each heading. Be sure to designate your site map as a tier 2 page. That way it will serve double duty by keeping all your web pages within one click of your home page. architecture of your website to improve SEO and provide a navigational aid for your visitors. Hey, by the way. . . Bits and Bytes would love to send you a steady supply of quick and easy site building tips!